In some of my posts I feel like I’m only one step away from preaching. This is not what the site is all about. Instead I’m trying to sow some seeds which give enough information to encourage readers to go off, do their own research and make some of their own decisions away from the so many vested interests that want your money today. Today I’d like to run a case study on myself to see if I’m practicing what I “preach” and whether the seeds I’ve sown are actually growing. I’m going to break this down into 3 sections which broadly cover everything that this site is about – Save Hard, Invest Wisely, Retire Early. Before we go there let us first set the scene. I graduate in 1995 with precisely £0 worth of assets. I start living my life like most others – get a job, start consuming, get myself into debt with a car, then get myself into debt with a house and finally save a few percent with the scraps that are leftover both personally and through an employer defined contribution pension. 2007 comes around quickly and I have one of those light bulb moments. While preparing some financial documents I actually calculate how much I’ve earned over those 12 years and looked at how much I had to show for it. It was a scary moment where I realised something had to change. Not realising I was probably no different to 99% of the population I immediately assumed I was well behind the curve. I thought if I was to catch up I needed some professional help and so I visited a few Independent Financial Advisor’s (IFA) with a view to picking one to help me. After the meetings I sat down and thought a little about what I’d just been through. It all sounded so impressive and clever but working through each point in turn made me feel that they were deliberately trying to make it sound complicated. It was also at about the same time that I saw the book Where Are the Customers' Yachts? I made a decision. I was going to take responsibility for my own actions and control my own destiny. If it worked I could proudly say I’d done it and if it didn’t then I only had myself to blame. 2008 was then the year where I developed the strategy that you largely see me using today. I made some mistakes but it was largely positive. Then in 2009 this site was launched and I’ve been staying the course ever since. So what is that course? Let’s visit those 6 words again - Save Hard, Invest Wisely, Retire Early. There are 3 elements to this and none of them are easy. Firstly, if I can maximise my earnings power I can then maximise savings. In most industries I believe that it is about 1% inspiration and 99% perspiration. I’m not the most clever person in my industry (the 1% inspiration) however I am one of the most hard working (the 99% perspiration). For me that’s leaving home a little after 6am every day, not returning home until around 8pm and working nonstop while at work. Additionally I have never asked for a pay rise in exchange for what I am about to do. Instead I’ve done any job that could get me to the next level without complaint. Then once I’d secured the new responsibilities I researched what that new role was worth and then asked for that salary. The result is that my nominal earnings are up 70% since 2007. Sure inflation has taken a large chunk of that benefit but I’m still ahead. Secondly, I haven’t increased my standard of living to reflect the increased earnings. All of those extra earnings have instead been invested. Thirdly, I’ve actually reduced expenditure by opting out if consumerism and living a far more frugal life. These 3 elements now enable me to regularly achieve a savings rate of 60% of earnings. This is clearly laid out in detail here but in simple terms it is a non emotional mechanical strategy focused on diversification, minimisation of expenses, minimisation of tax and an understanding of the damage that inflation can wreak on a portfolio. Back testing the portfolio suggests I should be able to make a Real (after inflation) Return of around 4%. Calendar year to date it’s up a nominal 10.3% with a couple of weeks to run. So even allowing for inflation I’ve so far won this year. You might even say I’ve Invested Wisely. This is the goal and the fruits of the Save Hard and Invest Wisely. 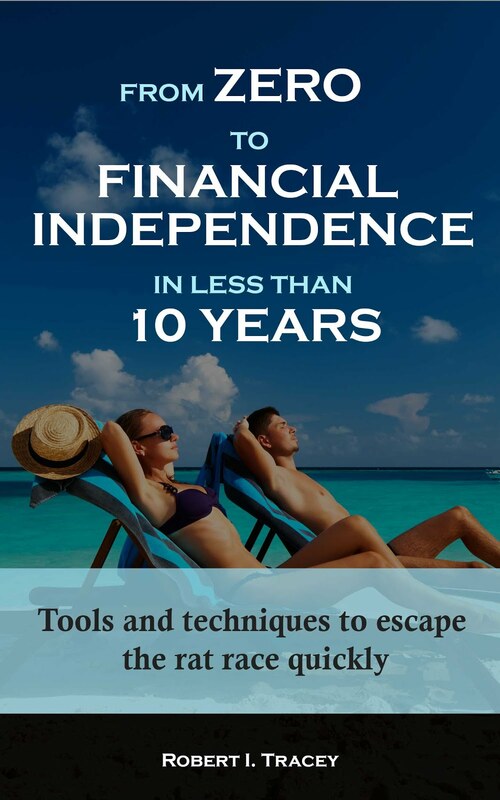 For me retirement is really about financial independence with work becoming optional. What will I do when I reach retirement? I haven’t given myself the pleasure of dreaming about it yet as I still have a few years to go. All I can say is that the chart below shows me that my 2007 decision has set me on a new course and with a fair wind early retirement is within my grasp. How is your course looking? Thanks, a nice overview. A lot of people should read this - I guarantee they'll recognise a lot of themselves in the earlier stages of your experiences. The graph reminds me that I've always envied how you have such a clear target that you can put a simple % figure on your progress. Obviously I don't need to know what your target is, but I'd be very interested to hear how one would calculate their magic golden figure? As everyone is different, as you suggest, I won't use actual values. That said I'm happy to define my method. Firstly, all my calculations are done in todays £'s (ie ignoring inflation). How I correct for inflation is covered in the calculation below. Let's go back to 2007. I sat down and worked out what annual "salary" I would like in "retirement" to live the lifestyle I desire. I also worked out what real (ie after inflation) annual return I believed was achievable from my portfolio. By dividing the salary by the real return I arrived at my first magic golden figure. Going forward. I now have an Excel sheet which monitors both my current and forecast portfolio values. Part of this sheet automatically calculates the return for each asset class based on my datasets, including forecast returns based on decreasing my risk profile as I age. I update this weekly and see the return values change ever so slightly based on my current and forecast asset allocations. Additionally, on a preset date every year I uplift my target annual salary by that years RPI. This is also saved in the sheet. 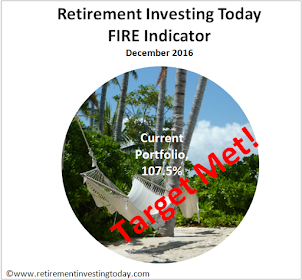 The sheet automatically does the division meaning every week when I update my portfolio value I see the progress to retirement chart as shown in my left hand sidebar. I do like this post. I especially like Save Hard part since without savings, can you invest wisely or indeed, even retire early? I can sympathise with you on working long hours. I also do the same. Leaving home at 5am and coming home at 7pm are harsh, but the amount I gained when I open my payslip every month always make such efforts worth it. Due to the nature of my job, I have a great amount of overtime available for me to take. I naturally worked all of them. When I looked at my colleagues, I am often surprised by some who is unwilling to work overtime, yet complains about money. I agree with you. The hard work gives the basis onto which you can invest wisely which is the enabler to early retirement. Unfortunately, I'm not paid overtime. The hard work for me is more a means to get promoted and to keep me employed during the bad times. A simple principle I follow is to try and stay in the top 10% of my peer group within the working environment. It's unfortunate that the working environment has to be so competitive but that's life within a capitalist society I guess. Outside of work I'm of course a very different person and have little desire for competition. You pretty much have it nailed but actually implementing it is the hard part. Being extremely frugal when everyone else you know is blowing money left and right can be hard, and can make you feel left out at times. But if you can keep your priorities straight you'll make it out ahead.